Washington (CNN) – President Barack Obama's approval rating is up five points since December as a growing number of Americans consider him a strong leader who is tough enough to handle a crisis, according to a new national poll. A CNN/Opinion Research Corporation survey released Tuesday also indicates that a jump in support by independent voters is behind the overall rise in the president's approval rating. Fifty-three percent of people questioned in the poll approve of how Obama's handling his duties in the White House, up from 48 percent in a CNN poll that was conducted last month, as a very productive lame duck congressional session was nearing completion. "Obama's approval rating among Democrats and Republicans is virtually unchanged since December, but among independents it has grown from 41 percent in December to 56 percent now," says CNN Polling Director Keating Holland. "It's possible that his call for greater civility in the aftermath of the Arizona shootings was seen as a boost for the bipartisan solutions that typically attract independents." The survey indicates that 59 percent of the public now thinks the president is tough enough to handle a crisis - up six points from last year - and 57 percent now consider him a strong and decisive leader - a four-point gain. "That may be an indication that the public is seeing Obama as more 'presidential' after his reaction to the tragic events in Tucson," says Holland. "The president's speech in Arizona last Wednesday night may have helped as well. Nearly nine in ten say they consider him to be a good speaker and communicator, roughly the same number who felt that way about Ronald Reagan in 1984, and his call for greater civility in politics wins near-unanimous agreement from the public." On the other hand, Americans are not optimistic that he can achieve that goal - only a third believe that he can end the partisan gridlock in Washington. And his biggest Achilles heel remains his positions on the issues, according to the survey. "The poll tested Obama on a variety of personal characteristics, and he gets high marks for honesty, sincerity, leadership skills and compassion. But most Americans say that they do not agree with him on important issues, and the public is split over the direction in which his policies will take the country," adds Holland. Nonetheless, Obama's 53 percent approval rating at the start of his third year in office is six points better than Bill Clinton's at the same time in his presidency and 16 points better than Ronald Reagan's figure in January of 1983. He hasn't done anything lately. People are just happy that he's not out there actively destroying our nation. President Barack Obama's approval rating is up five points since December as a growing number of Americans consider him a strong leader who is tough enough to handle a crisis, according to a new national poll. Strong enough and tough enough to deal with a crisis? We have a 9% unemployment rate reported with a 25% unreported, that translates to nearly 22 million unemployed. Those that remain employed unscathed are government employees paid for with tax dollars, Obama has spent nearly a trillion dollars on the "crisis" without any effect. Our current debt is nearly 14 trillion dollars approaching the credit limit ceiling and guess who is coming for dinner? Obama's leadership has driven our Nation into bankruptcy threatening our sovereignty and security by allowin our Nation to become financially subservient to CHINA! ONE TERM WONDER...otherwise America as the Republic shall no longer exist. His centrist policies are winning independents over, but Conservatives have already painted him as an extreme left winger (hint: he isn't even close) so I don't know if he can win conservative over no matter how central his policies are. He has been losing a lot of actual progressives, but who will we vote for anyway? A 3rd party? I am not sure why people think he is tough enough to handle a crisis. He has not proven it yet. He fumbled the stimulus, healthcare is a disaster waiting to happen, and he has not created any new jobs. Sound like a "F" grade to me. Easy, he has not stolen any money for the unions and left wing nut jobs in the last few weeks (he took more than enough in the first two years), he has kept his mouth shut fairly well (some inncomunicado time in Hawaii at our expense) and the adults now control the House, although we still have "Dingy Harry" not letting any repeal of health care bill come up in that "tranparent" "citizen serving" democrat liberal controlled den of thieves he runs. Can you imagine, people want this thing gone, and the lord of the anthill won't even let it come up? Imagine how upset and viscious the democrat liberals like Shumer (hey, here I am, aim that camera at me) and Leahy (the phony hypocritical creep) would be if a Republican Senate Majority Leader did that. Harry is so crooked it is no wonder the unions poured all that money in to steal the elcection for him. America is waking up and smelling the coffee. As an aside, I absolutely love the look on the senior white lady holding out her hand to shake her President's. The look on her face is worth a thousand words, and this is what the Republicans in power have been trying to destroy for the past two years......and cannot. 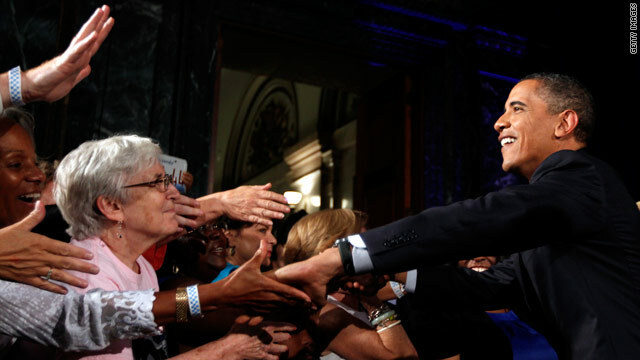 People of all colors, and ages GET this President, and he connects with them. And this is just the start. Well done Mr. President.